Just as the title suggests, this post is about 5 movies which are book adaptations. Book-to-movie adaptations aren't the best thing there is in the whole of a book junkie's life. Most of the time, the sentence "the book was better" is the best way to describe one's feelings about a movie adaptation of a certain book. I've certainly had times I felt that way but here are 5 books to movies that I like talking about in 4 different categories. A lot of people have mentioned about the 1996 version being better than this. I have yet to watch that adaptation but this version has captured my heart just as the book. Keira Knightley and Matthew Macfayden melted me the moment they were portraying the timeless characters. Not only were the actors great and astounding in their portrayals, but the setting was very much captured properly. The scenes felt very Regency era, and I think to feel like being able to go back to that time is really a beautiful feeling to have. No words can explain how much this book tore my heart apart. Just the same, seeing that (spoiler) scene while Rudy was slowly dying in front of Liesel pleading him not to go, my soul was crushed to a million pieces. That's how much the movie punched me in the face even after I was greatly emotionally tortured by the book. The acting was great even if most of the actors were newbies-- especially those who portrayed Rudy and Liesel and Max. It was the first time I found movies with these actors but now, I'm looking forward to their projects because Nico and Sophie are adorable, and Ben--- irresistably hot! Please turn this book to a movie. I hate my horror films as while they don't freak the hell out of me while watching the movie, they stay with me after the movie. That is what happened to me after reading this book. But while the experience was really haunting, feeling as if Anna's eyes are locked on you while you're sleeping at night, I feel like this book would be great if it were given life on the screen. The characters were given a vivid description on the book, reason why the life of this book was so terrifyingly real. I would watch this thing even if they categorize it under horror-- and maybe I'd have to deal with the haunting sensation for a while. I should really see these book to movie adaptations. ASAP. 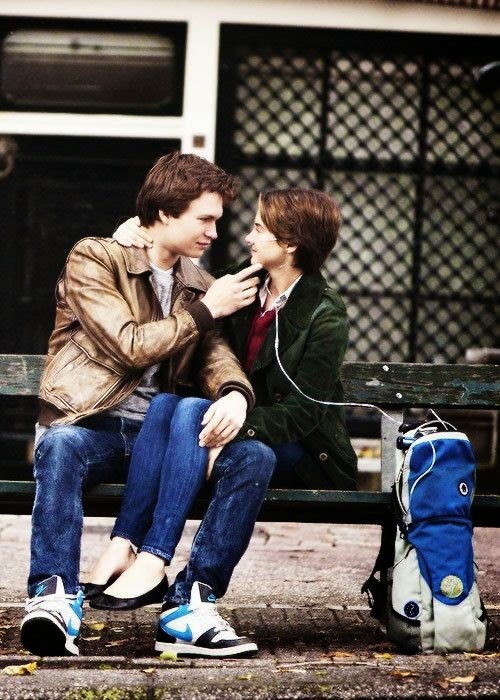 It's a book loved by millions and no wonder this was turned to a movie. While I was one of the very few people who have read this book without the pull of the whole world making me read it, I haven't watched the movie yet. I was planning to do exactly that since I was watching John Green's vlogs on the set but when it came out with Maleficent-- I thought it would be nice to watch that Disney movie instead (no regrets though). I'm looking forward to see this movie , infront of my laptop, at night, with a bucket of microwave cooked popcorn, tissue boxes and just my hopeless romantic self. I am guilty as charged of watching the movie before reading the book. I would've read this Jane Austen classic before watching this movie if only JJ Feild wasn't playing Mr. Tilney. Bonus points to having Felicity Jones (who I started to love after I watched Chalet Girl). 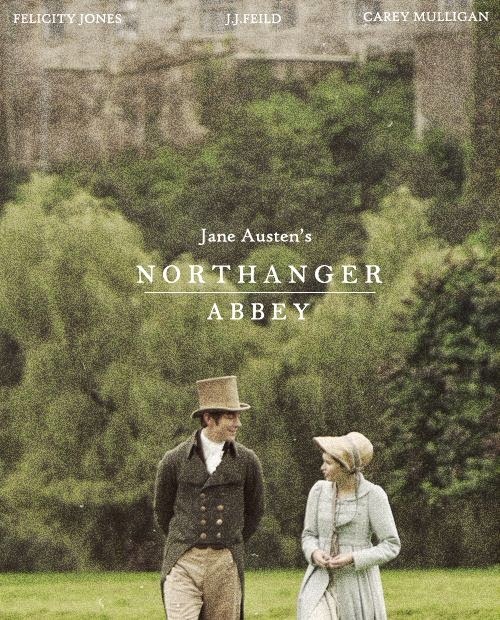 I found the movie for Northanger Abbey while I was searching through more of JJ Feild's stuff because of his cute role in Austenland (which is another Austen-referenced movie). The movie offered a wonderful portrayal of what I suppose is a wonderful love story as well so I am looking forward to more cheesy Jane works, and of course, butterflies in my stomach for another wonderful Austen man who blows away girls effortlessly. Yep, I am aware of the cheesiness and common grounds of these movies but I can't help it! I'm a big fan of sappy romance... oh wait-- I live for it.